West African soccer fans like to turn matches into carnivals and the 2010 World Cup qualifier between Cote d’Ivoire and Malawi was no exception. Tickets had sold out long beforehand and the newly refurbished Houphouet-Boigny Stadium in Abidjan was packed with an exuberant crowd, gloriously costumed and painted in the Ivorian team colors of orange, green and white, playing musical instruments, cheering and dancing. There were high hopes of success. Not for nothing are the Ivorian team known as ‘The Elephants’: robust athleticism combined with sound technical skills makes them a force to be reckoned with. Several of the national team play for European clubs and among the stars the fans had come to see were Hibernian defender Sol Bamba, Chelsea striker Salomon Kalou and Cote d’Ivoire team captain Didier Drogba. Long before the match was due to start the crowd around the stadium was already heaving. Then, just before kick-off, a wall collapsed as fans jostled to get into the game. Pandemonium broke out and police fired tear gas into the surge of fans, making an already bad situation even worse; anyone who stumbled was crushed or trampled underfoot in the panic. Amazingly, the match went ahead as though nothing was happening; Cote d’Ivoire defeated Malawi 5-0. Though officials blamed ticketless fans for the tragedy, a FIFA enquiry concluded that the Ivorian Football Federation (FIF) was responsible. The security staff had not been sufficiently trained or equipped to prevent a stampede. The FIF was fined and ordered to pay compensation to the victims’ families. 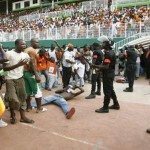 The Houphouet-Boigny tragedy was just the latest in a series of disastrous football stadium stampedes across the African continent, all due to lack of proper crowd control. You should know: In high-scoring matches in 1992 and 2006, Cote d’Ivoire defeated Ghana 11-10 and Cameroon 12-11. Both matches were clinched by 24-shot penalty shoot-outs, the highest in international football.